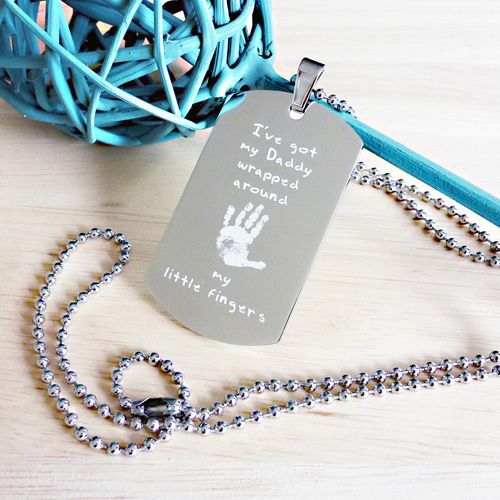 Personalised dog tag pendant engraved with your child's miniaturised handprint and the wording 'I've got my Daddy wrapped around my little fingers'. The rear of the tag can be engraved with the message of your choice. 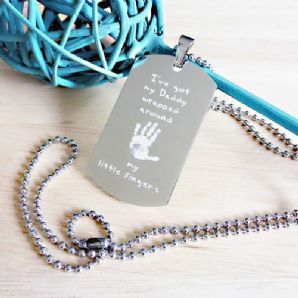 This keepsake would make a lovely gift for daddy's, or for Grandad as the wording can be changed to your requirements. The dog tag comes presented on a 24 inch ball chain, and all materials are made from stainless steel. Stainless steel makes an excellent choice as it has a lovely shiny luxury feel and does not tarnish overtime. If you don't already have a copy of the print you would like to use then your child's print can be taken through one of 2 methods, either by using paint or by purchasing one of our inkless kits. Option 2 Inkless Kit (Additional charge) - An inkless kit can be purchased for an additional fee when ordering the bracelet. Our mess free kits are easy to use and consist of an inkless wipe and 3 * A5 sheets of special coated paper, each pack comes with instructions for use. 1 Kit is suitable for 1 child only. 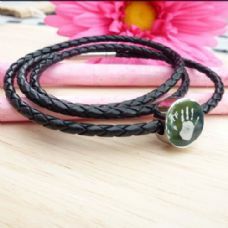 Should you already have a good clear copy of a hand or footprint you are more than welcome to email this to us, which will enable us to create your keepsake much sooner. Our email address for sending the print is info@jacknverasgifts.co.uk. 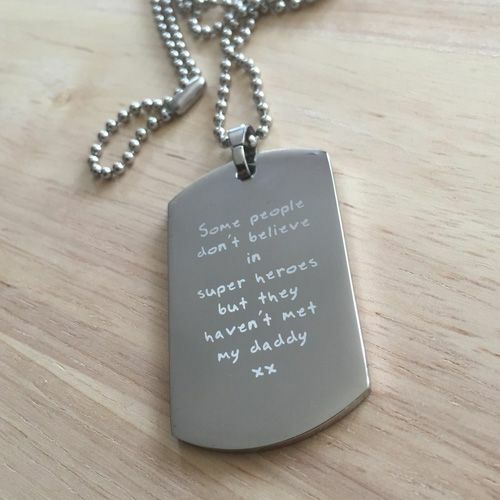 To order please enter your message you would like to be engraved onto the rear of your Dog Tag. Please select if an inkless kit is required or if you will be forwarding the print to us. If an inkless kit is required this will be despatched with first class post and normal processing times will apply once the print is received back at the studio. There is also a box for any special instructions. If you have any additional requirements please use this box to advise us.